Environmental planners throughout the Planning Department strive to achieve sustainability in Montgomery County. By protecting the ecosystems that purify air and water and provide habitat for living things by designing, restoring, and maintaining places that mimic nature, we reduce carbon footprints and contribute to healthier, happier communities. Our work involves assisting property owners who wish to improve or develop their properties, analyzing natural resources for community planning and reviewing development applications, and participating in efforts to promote environmental sustainability for county residents, business and visitors. Our recommendations are designed to help create sustainable communities by addressing resource protection, climate change, air quality, water quality and availability, and human health and well-being. If you are buying or improving a property, or curious or concerned about activities on land in your neighborhood, learn about our tools that can inform you about county rules, current development activities and how to report a violation. Presence of floodplains, stream buffers, Special Protection Areas. Forest covers approximately 30 percent of land in Montgomery County. Protecting existing forest and tree cover and planting new forest when there are losses, helps maintain water and air quality, provides habitat for plants and animals, promotes cooler temperatures and keeps carbon from contributing to global climate change. The Forest Conservation Law [PDF] aims to save, maintain and plant forested areas for the benefit of county residents. The law, which applies to landowners who plan to develop their properties or may affect the viability of a state or county champion tree, restricts tree removal and mandates the planting and maintenance of forest and trees. Learn more about how the law works in Montgomery County. Note: The above mentioned “Forest Conservation Law” link is in effect until Sunday, February 25, 2018. The New “Forest Conservation Law” takes effect on Monday, February 26, 2018. The new Forest Conservation Law link can be found under the “Forest Conservation and Trees” Tab – Latest News. Forest conservation easements protect forests, streams and wetlands on private land by limiting activities. Easements are most often established when other parts of the property are approved for development. Environmental planners have mapped the approximately 3,000 of easements across Montgomery County and provided information about how to respect easements and protect natural resources. 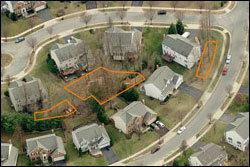 Locate areas under easement using our online mapping tool. This program protects large areas of forest, which are used to meet developer forest mitigation requirements in an offsite location. The Montgomery County Planning Department administers this program by approving bank locations and monitoring transactions between developers and bank owners. Banks may be created by planting a new forest or by protecting an area where forest is already established. Once a bank is established, the forest is protected permanently. As part of our forest conservation efforts, we are planting forests in stream valley parks to improve water quality and habitat. Our reforestation projects are funded by developer contributions to our Forest Conservation Fund. Learn more about our public replanting projects. To increase urban tree canopy, we have launched Shades of Green, a program that provides free trees to property owners in 21 central business and road code districts. The Montgomery County Planning Department has launched Leaves for Neighborhoods, a tree planting program to increase the county’s tree canopy on residential property. 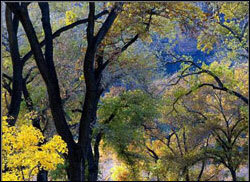 Partner with us by planting shade trees in your yard with help from our discount coupon [PDF]. In 2011, planners analyzed Montgomery County’s tree canopy — the layer of leaves, branches, and stems of trees that cover the ground when viewed from above — as part of an effort to improve the local climate of urban areas. View our analysis of Montgomery County’s urban tree canopy and efforts to improve. Streams are the backbone of environmental sustainability. Water sustains life as it flows from rain through plants, wetlands and forests into waterways that lead to the Chesapeake Bay. Protecting streams and their buffers — wetlands, floodplains and slopes — is essential to a healthy environment. These sensitive areas provide habitat, cool clean water and natural areas to absorb flood waters, avoiding damage to private property. 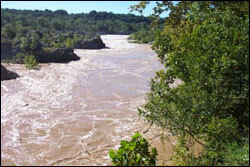 The Environmental Guidelines & Reports describe how to identify environmental buffers. Planners conducted a year-long project on environmental site design (ESD) focused on street edges. ESD integrates site design, natural hydrology, and other controls to capture and treat runoff. The project resulted in plans for retrofitting streetscapes in suburban and urban areas to better handle stormwater and improve the environment for pedestrians and cyclists in addition to motorists. The Water Resources Functional Master Plan examines Montgomery County’s land use, growth, and stormwater management in the context of adequate drinking water supplies, wastewater treatment capacity, water quality regulatory requirements, and inter-jurisdictional commitments. Some particularly sensitive, high-quality stream systems require special protection from development. An effective way to protect county streams is to designate all or part of a watershed a Special Protection Area, a label that identifies streams and related natural features as very high quality and calls for minimizing impervious surface cover in development projects. Development or redevelopment projects in three SPAs are subject to specific limits on impervious surfaces. In a part of one SPA, the Planning Board limits impervious surfaces during development or redevelopment to as low as 6 percent of the project area. Montgomery County provides policies for extending water and sewer service and describes a process for requesting service. The county’s Department of Environmental Protection prepares the Ten-Year Comprehensive Water Supply and Sewerage Systems Plan and sends it for consideration and adoption by the County Council. By state law, the Planning Board reviews the plan and any amendments to ensure they remain consistent with community master plans. To better support native species, maintain ecological processes, sustain air and water resources, and contribute to human health and quality of life, environmental planners drafted a green infrastructure plan to protect an interconnected system. The plan, which was put on hold due to 2010 budget cuts, will consider greater environmental viability, value, and function than the sum of the individual resources and develop strategies to protect a connected network of waterways, wetlands, woodlands, wildlife habitats and other natural areas of countywide significance.